1) Shops in Texas or surrounding states only please. 2)Only post if you or a close friend or family member has had direct experience with the shop...no hearsay please. 3)Please title your post with the type of shop and the city it's located in... I.E [color:"blue"]Muffler shop in Dallas [/color] And include as much information as you can give...shop name, address, phone, name of person you dealt with, and what kind of work they do. 4)If you have had a [color:"red"]negative[/color] experience with a shop and want to post a warning just post the shop name and location (address preferred) and state in your post "Please PM (or email) me for information on this shop." This allows you to share negative information in a way that doesn't pose potential problems to Bob and the forum. 5)No personal ads for your own shop here. If I find out someone uses this forum to fake recommendations for their own shop they will be banned from this forum. 6) Make sure that if you use a shop recommended here you let them know you "heard about it on the VMF!" "The following post is for Texas VMFers to post their own personal experiences. These posts do not represent the views of vintage-mustang.com, Bob Dooley it's owner or any of it's employees, friends, family, neighbors, pets, inanimate personal possessions or any other entitety either living, dead or un-dead." I visited a shop in Dallas today that was recommended by Dallas Mustang. The shop's name is Curtis Body Shop, address is 1611 Barnes Bridge Rd (near corner of Jupiter and Garland Rd) phone 214-327-2023. Owner's name is Ronnie Howell (bought shop from 'Curtis' and kept name). Really nice guy, had two Mustangs in shop at the time I visited. Seems familiar with Mustangs and their repairs. 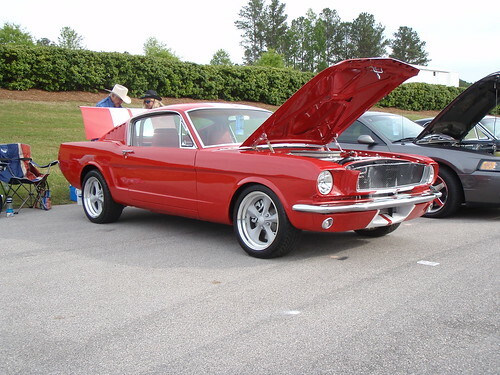 He is the ONLY ONE of the several I have called that is willing to work on rust and collision issues of these early Mustangs and not only on insurance collision repair. I have not had any work performed here so I cannot speak from experience , but from what I saw on one car it looks like he would be a good person to keep in mind. This place was a recommendation from AAA Muffler as they couldn't rebuild my differential. They rebuilt the rear end, cleaned it &amp; painted it for $400! I also had them replace a dropped valve, ported the valve, shaved the bottom of the head, replaced the belts (without me asking) and flushed the radiator for $540. I thought it was a totally fair price considering the major surgery performed! These guys build some of the baddest Street Rods in the area, Roger (a Mustang guy with a bada$$ 66 pro street coupe) came from Sachse Rod Shop who also builds some incredible rides. I had my Vintage Air system installed here for $2K total...great job. Highly reccomend 'em! The owner Wayne Killabrew, does beadblasting coating and chroming, has a huge variety of street rod stuff, chrome parts and accesories for all makes. Killer shirts and other vintage hot rod stuff...great place! Just look for the black 55 Bel Air ala American Grafitti sitting out front! "Holly" Red 65 Coupe, white interior, front discs, 1" drop front springs, KYB's, swaybars, 16" Budnik Billets, Vintage Air and XM Radio. I had good experiences with Lone Star Transmission in Rockwall. The owner's name is Sparky, good guy and is very involved. Had my c4 built with kevlar bands and new throttle body for $650 installed. I want to recommend to people in Houston looking for metal rechroming. Contact Craig Bierman at Chrome Plating, 404 Broadway, Houston, Tx 77012. His phone number is 713-921-0235. Craig does oustanding work and I highly recommend him for show quality plating. Make sure you tell him Ray Azcue with Quality Mustangs sent you. Location: Houston TX - I drive mine. Wanted to mention the shop in Houston that rebuilt the 4-speed Toploader and third member in my 67 GT350. It's Texas Auto Gear on 314 West Carby. I know that David Kee in San Antonio does excellent work on Toploaders but I did not want the hassle of having to ship the transmission. Texas Auto Gear replaced the seals and bearings in my transmission. It shifts great and doesn't leak. They also replaced the spider gears in my 9". They have a 12-month warranty on their work. They can be reached at 713-697-0388 or 281-448-4371. 1973 Mustang Convertible, white/white, black stripes, Q-code (351C-4V), ram air. 1968 1/2 428 CJ convertible, R-code, red/deluxe red, auto, finally finished. "If you find the car of your dreams, ignore the price guides and pay whatever you have to in order to get it." The starter was dragging in my 67 GT350 and the replacements I bought would not fit properly. I decided to try having the original one rebuilt. I took it to Chris Auto Electric at 6339-A Skyline (near Richmond and Hillcroft). For $80 he rebuilt the starter. He also cleaned it up and detailed it. It looked great and worked even better. It will start the car when it's hot even with 18 degrees of initial advance. They also do alternators and generators although I have not used them for that. Sunrise Paint and Body in Alief (southwest Houston) comes very highly recommended by the Mustang Club of Houston. Several of the members have had their cars done by Sunrise. Update on Chris Auto Electric in Houston. They just rebuilt the alternator in my GT350 for $70. It was an "MCA correct" one from AMK so I did not want to buy a new one. Did a great job and fast turnaround. Their phone number is 713-266-7100. I have used this business, He does work on a regular basis for a local Mustang restorer as well. Not the cheapest but top rate. Located 1/2 way between Oak Hill and Dripping Springs. Last edited by 70_Cougar; 09-18-2010 at 10:55 AM. I know I'm a little out of my region, but I'm having quite a bit of work done to my 68 fastback at Keith Craft Motorsports in Plano and it was suggested to me (by fast68back)that you guys might be interested to hear of my experience. First off, I had the engine (463 cu in stroker 428 CJ) built by Keith Craft Racing in Arkansas. I can't say enough good things about Keith and his staff. The engine put out better numbers than promised (he promised a minimum of 575 hp and I ended up at 601.6), it was done ahead of schedule and for less $ per hp than anyone I else I talked to. In short, I highy recommend these guys, especillay if you guys are like me and just don't have the time anymore to do all that wrenching. It was really hard for me to pay someone else to do what I can do myself, but in the end there's no way I could have done what they did especilaly in any kind of a timely matter. Feel free to contact me with any questions. Longhorn Glass off of IH 35 (exit 236) is WAY awesome. The main guy, Fred, went to San Antonio, pulled glass out of a '71 for me, brought it back to Austin and sold it to be for 150 a piece. They were very good condition AND he buffed out some of the little scratches out in it FOR FREE. I highly recommend this shop. They've really taken care of me. 9in 31 spline 4.30 Winters Performance True Trac, 4r70w manual valve body and hardened gear set, 408w with 225 High Ports, FTI Solid Roller cam, Super Vic; Aluminum MMC driveshaft, 3" Exhaust.